On Saturday afternoon, Jozy Altidore says he was going to get into a car in Los Angeles, drive down I-5 to Chula Vista and do what he had not done since Oct. 10, 2017, and that's meet up with the U.S. national team. Recovering from ankle surgery last fall, Altidore has not played for the USA since it lost to Trinidad & Tobago, 2-1, and failed to qualify for the 2018 World Cup. He's not in January camp to train, but just to be around the team for a little bit and help out any way new head coach Gregg Berhalter wants. "I look forward to helping in any way to bridge the gap or whatever is needed," Altidore said before leaving MLS's annual Media Day in Los Angeles. "I think we have a very bright young generation coming through. And it will be exciting to watch them grow and give them all the tools they need to succeed." Altidore says he doesn't remember when the USA had so many young players playing at such big clubs. "Tim Weah scored a goal today," he said. "You've got [Weston] McKennie playing. You've got Tyler Adams making his debut [in a friendly for RB Leipzig]. I think it is really exciting." Business as usual. Like them, Altidore was just a teenager in 2008 when he moved from the New York Red Bulls to Spain's Villarreal for a transfer fee reportedly close to $10 million, nearly twice as much as the previous record for an American. The American record for a transfer was shattered earlier in January when Chelsea agreed to pay Borussia Dortmund an estimated $73 million for Christian Pulisic. Inside the American soccer village, the transfer was analyzed and debated from every angle, but in the bigger world of American sports Altidore says the Pulisic deal went unnoticed. "If you were an American and watched American TV," he said, "you'd think it never happened. Elsewhere around the world, it was a big thing, but I was disappointed in the States it was kind of business as usual. I guess they have a lot of guys going for $70 million." Altidore says he's happy for Pulisic with whom he played on the national team in 2016 and 2017. "I think he will do great," he said. "We just need to support him. Like players at any other clubs, there will be ups and downs. In the big picture, you need to give him space to still grow." Altidore says Pulisic's transfer was a missed opportunity to show what American soccer can be. "I just think it would be great to show people here an American kid who's been given the opportunity to go to one of Europe's biggest clubs," he said. "The transfer fee is huge. It ticks every box if you want to portray it to the youth to get them more into the sport. Soccer in a lot of ways is not looked to kids, to inner-city kids, as an opportunity to make it out, to make a life for yourself. We don't have a lot of those stories. This was a great one. And I thought it was a missed opportunity to shed light on what this game is about." Altidore says there will be more of those stories, though, as MLS academies produce more players like Canadian Alphonso Davies, whom he described as a "stud" and who dressed on Friday at the age of 18 for Bayern Munich. "Stories like that are fantastic for the league," he said. Simply not good enough. Altidore is coming off the longest offseason of his career. 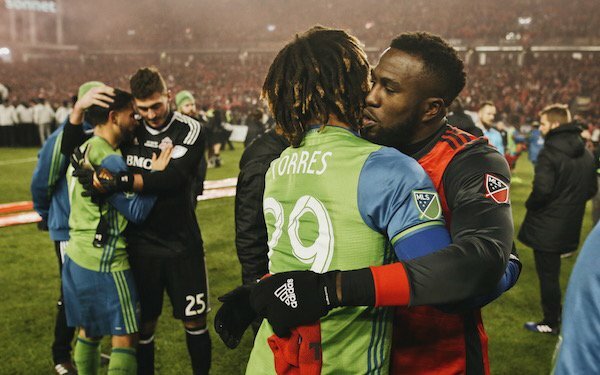 After reaching MLS Cup in 2016 and winning it in 2017, Toronto FC failed to make the 2018 playoffs. He said the Reds simply weren't good enough and to blame the collapse on injuries would be naive. "We had no choice," he said of the 12 weeks off. "We got knocked out. We had a couple of months to do whatever. I had a chance to be more of a dad. I was domesticated. I was in the house cooking and all that stuff. It was fun. It was cool. But it was too long off. I missed playing. I missed being around the locker room and the guys. I am just excited to get back to work." Roots in Toronto. What the future holds for Altidore, 29, is unknown. His contract is up at the end of the year after five seasons with TFC and he doesn't know where he will be playing. "I've loved my time there," he says. "If it continues, fantastic, because I've grown roots there. My family loves it there." Like Altidore, Sebastian Giovinco and Michael Bradley, the other two Toronto FC Designated Players, will also be free agents at the end of the season. "Everybody knows what we are about," Altidore said. "Fans know what we are about and what to expect from us. 100 percent professionalism. To try to win games. To try to win trophies. This is what we came to MLS for. We're not like some teams, with all due respect, that just year to year see how it goes. We came to win, to push the envelope. If you look back at our time, I think we've done a lot of those things to be proud of. We have another year to make another dent." 11 comments about "Jozy Altidore on the 'missed opportunity' of the Pulisic transfer saga". Wallace Wade, January 20, 2019 at 9:04 a.m.
Altidore- “The transfer fee is huge”, does he know something we don’t? How will the transfer fee help American soccer? Who’s the beneficiary of any $ here in the US? Wooden Ships replied, January 20, 2019 at 9:22 a.m. I think he’s referring to the symbolism of the transfer. Wallace Wade, January 20, 2019 at 9:33 a.m. Youth Soccer Clubs in this country don’t run on symbolism. You can’t offer free soccer clinics for underprivileged kids and maintain fields and facilities on symbolism. Meanwhile, USSF is suing US Soccer Foundation, the one entity that actually helps with these types of things. No help for grassroots soccer in this Country? Sure seems that’s the case. beautiful game, January 20, 2019 at 10:36 a.m.
Altidore is a prime example of a talented American youth player who migrated to European soccer and never achieved the next level of consistent production...as Pulisic deserves time to pay dividends on his huge transfer fee, the jury will be out until he delivers. Jim Hougan replied, January 20, 2019 at 12:19 p.m.
Pulisic has delivered - and delivered in Europe. That's why Chelsea paid the seventy-million. frank schoon replied, January 21, 2019 at 10:58 a.m.
Jim , I don't see that...Delivered?, you have to be kidding...These transfer fees are way out of whack,like housing price in a bubble ,they are a joke. You want to explain to me ,exactly, what it is that makes Pulisic worth $73mil. R2 Dad replied, January 21, 2019 at 3:34 p.m.
Pulisic has made the same mistake Altidore did, going to the EPL too soon. Look at Salah--he wasn't ready the first time at Chelsea and he is a world class talent. As far as the transfer numbers go, since the Neymar-to-Barca saga 5 years ago, all the numbers have been "crazy" and detatched from actual value. It's a bubble FFP doesn't know how to pop. frank schoon replied, January 21, 2019 at 4:22 p.m.
beautiful game, January 20, 2019 at 2:18 p.m.
J.H...prhaps a senior moment...since the start of the 2018/2019 Bundesliga seasonPulisic has seen limited action on the pitch, spending more minutes on the bench...playing time is the barometer for consistency...as far as Chelsea is concerned, they'll spend as much as they want with oligarch money. frank schoon replied, January 21, 2019 at 11:01 a.m.
BG, don't forget Chelsea took Miazga ,which was a complete joke. Miazga is lucky if he could play for Pizza Hut Utd. R2 Dad replied, January 22, 2019 at 1:52 a.m. Unless you're gonna learn French, would never have advised this move for him.